I posted a link earlier this week (the one with the tractor and tow truck crushing the two cars) stating that the reason the snow never got removed properly from many neighborhoods outside of Manhattan was due to a protest being staged by the Sanitation Department... and as it turns out, I was right. There are a lot of article being published right now stating the exact same thing. There were already 400 jobs cut and the department was facing serving another 100 pay cuts. So, because a bunch of disgruntled UNION workers decided to prove a point, people died. I am sympathetic, to a point, these guys work hard and losing jobs and getting pay cuts hurts- but not only do they have paying jobs, in this type of economy causing ANYONE distress, pain or any sort of loss financial or otherwise is criminal. I combed a few places for articles about who was affected and in what ways and it seems that there was a really big theme- religious communities in Brooklyn. Whether on purpose (these communities represent a huge block of political votes because they tend to vote alike) or because these communities are known to be vocal about issues so it would guaranty publicity, the fact that this occurred at all is despicable. I witnessed an area of Manhattan Beach where I spent Wednesday (Three days after the storm!) where the tractor came down the same block three times in three hours, each time with it's plow raised. Someone I spoke with in Marine Park said her family could not even begin to get their car out of the huge snowbank that had drifted over it and they were stuck with unplowed streets until Thursday morning. Of course there are two sides to every story but here are a few stories that became victims through no fault of their own, which changes this from a simple protest to an almost terrorist act- something which is not tolerated in any way, shape or form. Before I get too into it, I want to repost a link I put up a while ago of the sanitation workers in my parents neighborhood who BACKED THEIR TRUCK onto the driveway next to the house- these guys get paid a phenomenal amount of money and treat the residents so badly...especially around Christmas when families who DON'T OBSERVE Christmas don't realize the guys want a tip- but don't worry, they let you know loud and clear when they start 'forgetting' you have garbage pickup or they drag the cans down the side of your car...both of which have happened. What's with people today? Why do they think it's ok? New York - There was a method to their madness. The selfish Sanitation bosses who sabotaged the blizzard cleanup to fire a salvo at City Hall targeted politically connected and well-heeled neighborhoods in Queens and Brooklyn to get their twisted message across loud and clear, The Post has learned. Their motives emerged yesterday as the city’s Department of Investigation admitted it began a probe earlier this week after hearing rumblings of a coordinated job action. Sources told The Post several neighborhoods were on the workers’ hit list—including Borough Park and Dyker Heights in Brooklyn and Middle Village in Queens—because residents there have more money and their politicians carry big sticks. “It was more targeted than people actually think,” said a labor source. “Borough Park was specifically targeted [because of] . . . its ability to sort of gin up the p.r. machine.” The plan worked. Residents of those neighborhoods—who, after three days, were still trying to dig out their cars—are apoplectic. “You have the most unbelievable anger I’ve ever seen,” he said of his Borough Park constituents. * A Queens baby was brain dead last night after poorly plowed roads hampered efforts to rescue him. 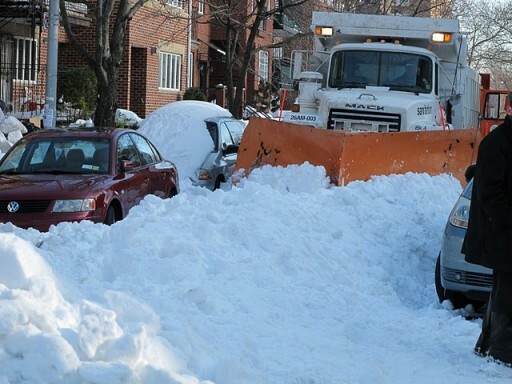 * Despite Mayor Bloomberg’s insistence that all roads would be plowed at least once by yesterday morning, many were untouched, with snow still piled high. “We still have work to do,” Bloomberg later said. “I saw plows driving around with their shovels up,” he fumed, adding, “I would like to see some disciplinary action to whoever made the call.” Hikind said his phone had been ringing off the hook. “I just know that something went wrong, and God is not to blame,” he said. Hikind said he had been told months ago that Sanitation Department unions were planning some sort of slowdown or job action to protest budget cuts. 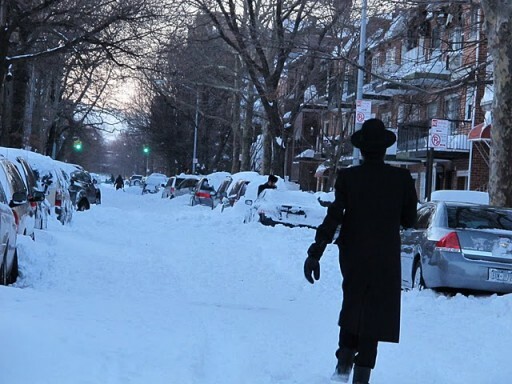 Chaya Schron, who lives in Midwood, Brooklyn, said she didn’t hear any plows passing by her bedroom window Sunday night or Monday morning. Gov. Paterson yesterday morning called for a criminal investigation, and Bloomberg said such a job action would be an “outrage.” A DOI spokeswoman told The Post her agency has been probing the actions of plow drivers and supervisors all week, trying to determine “whether there was intentional misconduct in connection with snow removal. We are in the throes of that.” The slowdown was confirmed Wednesday by City Councilman Dan Halloran (R-Queens), who met with a group of guilt-stricken plow drivers and supervisors who dropped a dime on their colleagues. Yesterday, Halloran provided The Post with two videos showing a plow driver in Queens driving his truck on a snow-covered road without plowing it. The snitches said they were told to leave many roads unplowed and skip streets that were not on their routes. The hostility stems from a series of labor and budget cuts that are culminating today with demotions—and resulting salary declines—for 100 supervisors. The president of the sanitation supervisors union continued to deny any subversion. And Harry Nespoli, president of the union that represents the Sanitation Department’s rank and file, also denied a slowdown and welcomed all investigations. He admitted, though, that some plow drivers could be slowing down on their own. “Look, individually, if you walk around, you’re going to see a truck doing something [wrong]? Yeah,” Nespoli said. “You’re going to have people that are annoyed.” Not as annoyed as the people whose streets were left buried.“It makes my blood boil. Those people should be reprimanded,” said Marlon Singh, 33, who lives on 94th Street in Middle Village. “They made us feel like we live in a Third World country". New York - These garbage men really stink.